Here we see the second in a series of lavender flavoured foods that I've tried recently. After the savoury oatcakes this sweet version is quite different. This is Waitrose so as usual they have tried to make the best thing possible and then figured out the price, instead of trying to make a price point product. 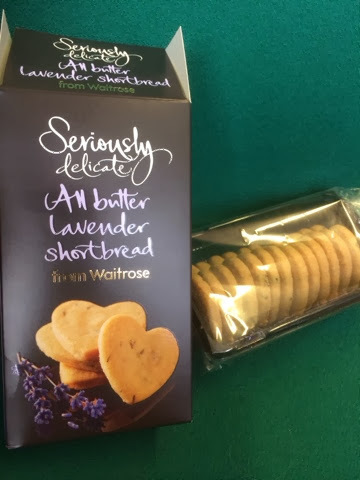 Because of this we have distinct folded layers in the shortbread and lots of air to enhance the flavour, a genuine butter taste and noticeable bits of lavender. The sugar on the outside is also not obtrusive and adds to the crunch nicely. The texture is crumbly and works well, but the flavour is still a little odd. The lavender works better with the sweetness but sits slightly at odds with the butter. While enjoyable (as all good quality shortbread is) it wasn't a rush out and buy variety. It was however much more popular with colleagues who were far more keen to have second helpings of this than the previous offering. The novelty and cool factor add together to make this a nice little gift and something that would go down well with the hot drinks over Christmas.